Traveling bridge crane can be widely applied in the steel mills, warehouses, workstations, plants for lifting heavy loading materials. Single Girder Overhead Travelling Crane, double girder overhead traveling crane, overhead traveling crane with a forged hook, and overhead traveling crane with grab are in store from Ellsen at factory cost. Apart from the overhead traveling crane, we can also provide you other cranes. 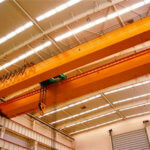 Any types of traveling overhead crane you need, welcome contact us without any hesitation. 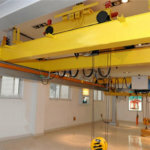 Traveling bridge crane is a crane that is rack-mounted in the workshop, warehouse, and yard. Because it’s two ends are located in the tall cement column or metal bracket, the shape of the bridge. The bridge of the gruas viajeras runs longitudinally along the rails on both sides of the viaduct and can take full advantage of the space under the bridge to lift the material from the ground. It is the use of the most extensive, the largest number of a lifting machine. 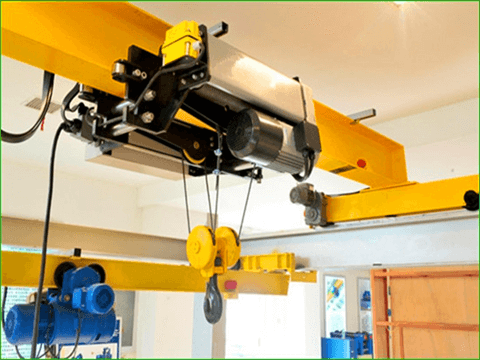 What fields need an overhead traveling bridge crane? The traveling crane can be widely applied in many working conditions. However, according to our experiences, it will perform its best when the crane has employed the following application fields. 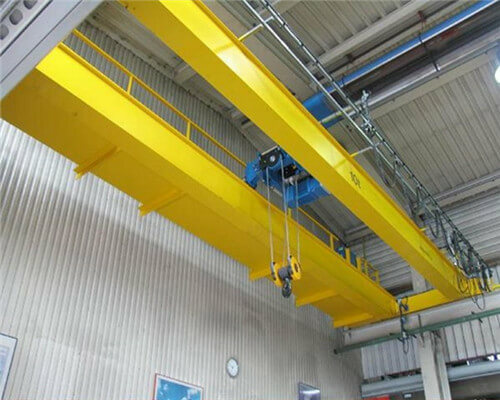 The Single girder overhead traveling bridge crane is an important tool and equipment for mechanization and automation of production process in modern industrial production and lifting transportation. Therefore, single-beam traveling bridge crane in the indoor and outdoor industrial and mining enterprises, iron and steel chemical industry, railway transportation, port terminals, and logistics turnover and other departments and places are widely used. We can offer you the electric overhead traveling cranes, such as the single girder electric overhead traveling crane and the double girder EOT crane. 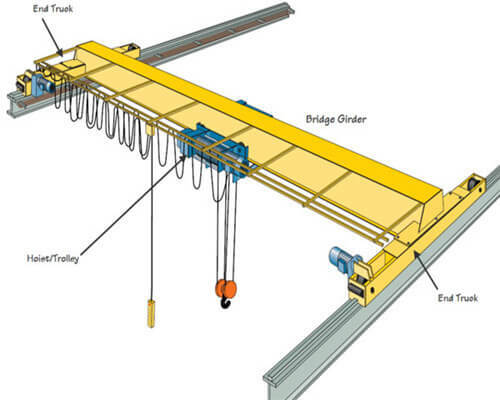 Here in Ellsen, we can offer you different types of overhead traveling bridge cranes for your facility. What should notice when we Operating a traveling crane? Each crane must be marked with a nominal weight plate in a noticeable place. When working, the bride is not allowed to people or with a hook to transport people. No operation permit and drink are not allowed to drive the crane. The operation must be concentrated, not allowed to talk, smoke or do things unrelated. The car to be clean and clean; not allowed to disassemble equipment, tools, flammable materials, explosive products, and dangerous goods. Cranes are not allowed to use overload. The following circumstances are not allowed to lift: tied not strong; mechanical overload; signal unknown; cable-stayed; buried or frozen in the ground of the object; was hanging objects on the people; no security measures flammable, And dangerous goods; over the liquid items; wire rope does not meet the requirements of safe use; a lifting mechanism is faulty. 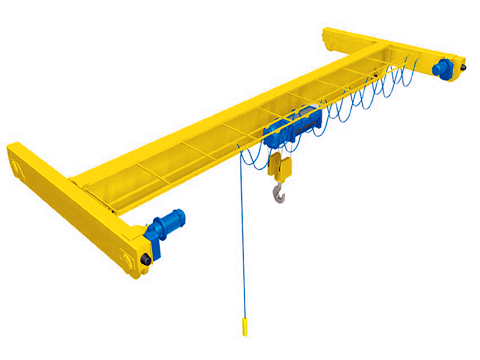 When the crane is running on a line without obstructions, the hook or spreader and the bottom of the hanging material must be 2m above the ground. If you cross the obstacle, you must exceed the obstacle 0.5m high. 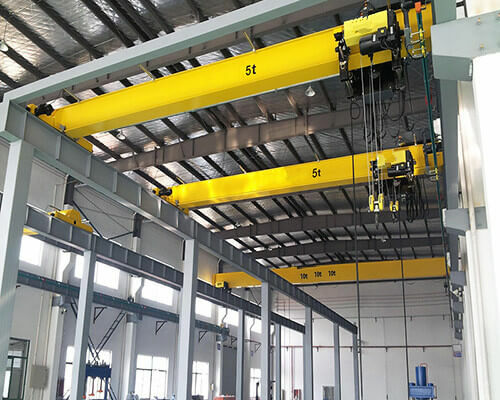 If you are interested in our overhead traveling crane, be free to contact us. Ellsen overhead bridge crane help center will be glad to reply to you as soon as possible.